WhatsApp can now be added to the list of Business Messaging channels. Jeroen van Glabbeek, CEO of CM.com has the following to say: "Last year business SMS traffic at CM.com increased by 41 percent. In addition to improving the current platform, the developers of CM.com have been working for some time to prepare our platform for the addition of other messaging channels. We went live in The United States with Google RCS/Android Messaging, and now WhatsApp is also being added to the platform. " Due to the great popularity amongst consumers, WhatsApp is a channel that has been on the wish list for many companies for a long time. Because there was no official link for businesses, companies found creative solutions to be somewhat accessible through this channel. There were companies that simply had telephones on the help desk to be able to communicate via WhatsApp with their customers. For several months, some companies used the Android WhatsApp for Business app. There were also some official tests. Where WhatsApp is free to use for consumers, this will not always be the case for companies. WhatsApp has announced that they will soon start to calculate 0.05 to 0.13 dollar per message. WhatsApp also charges costs when companies approach consumers and if a company does not respond to a message from a customer within 24 hours. When a customer starts a conversation with a company, the conversation (provided the response is within 24 hours) is free. Jeroen: "The fact that there are costs related to WhatsApp will prevent an excessive amount of messages and ensures that this channel, like SMS, can keep its value in the long term. Both for consumers and for businesses. " For customers of CM.com, the opening of the API means that WhatsApp can now become a mature business Messaging channel, just like SMS has been for years. Jeroen states that with the arrival of WhatsApp, we are now entering a next phase. "First of all, the arrival of WhatsApp means that the mobile number remains crucial to stay in touch with your customer. This applies not only to SMS, but also to WhatsApp and Google RCS. The mobile phone number remains the key to personal communication. " Jeroen: "We are now entering a new phase in which companies and consumers can choose more consciously through which channels they exchange messages." This means that companies can and should design their communication channels smarter. For the successful use of WhatsApp, a smart integration into your business software is important. Think of integration in your CRM, helpdesks and web applications. But also a smart combination of WhatsApp with your other communication channels is essential here like E-mail, SMS and Facebook Messenger. By choosing the right channels, you are always in direct contact with your customers via their favourite platform. 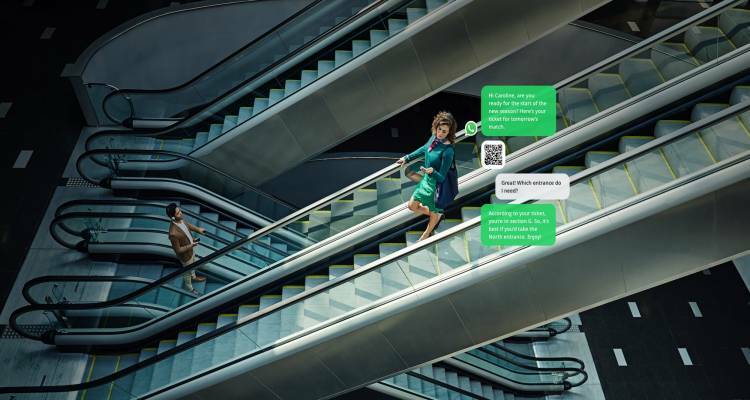 Our Communication Platform as a Service (CPaaS) helps companies not only to successfully integrate WhatsApp, but also to reach customers on the relevant channel and time of choice. Contact us now and learn more about the possibilities of WhatsApp for your company.